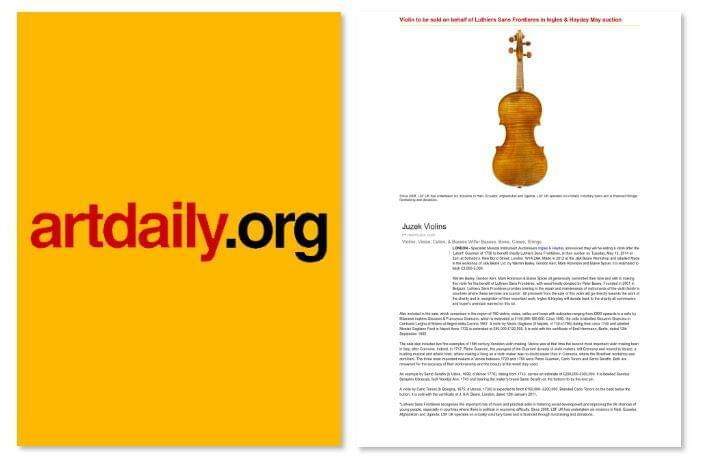 LONDON – Specialist Musical Instrument Auctioneers Ingles & Hayday announced they will be selling a violin after the ‘Lafont’ Guarneri of 1736 to benefit charity Luthiers Sans Frontières, in their auction on Tuesday, May 13, 2014 at 2pm at Sotheby’s, New Bond Street, London, W1A 2AA. Made in 2012 at the J&A Beare Workshop and labelled Made in the workshop of J&A Beare Ltd. by Warren Bailey, Gordon Kerr, Mark Robinson and Elaine Spicer, it is estimated to fetch £3,000-5,000. Warren Bailey, Gordon Kerr, Mark Robinson & Elaine Spicer all generously committed their time and skill to making this violin for the benefit of Luthiers Sans Frontières, with wood kindly donated by Peter Beare. Founded in 2001 in Belgium, Luthiers Sans Frontières provides training in the repair and maintenance of instruments of the violin family in countries where these services are scarce*. All proceeds from the sale of this violin will go directly towards the work of the charity and in recognition of their important work, Ingles & Hayday will donate back to the charity all commission and buyer’s premium earned on this lot. Also included in the sale, which comprises in the region of 180 violins, violas, cellos and bows with estimates ranging from £800 upwards is a cello by Milanese makers Giovanni & Francesco Grancino, which is estimated at £140,000-180,000. Circa 1680, the cello is labelled Giouanni Grancino in Contrada Largha di Milano al Segno della Corona 1667. A violin by Nicolo Gagliano (fl Naples, c1730-c1785) dating from circa 1740 and labelled Nicolaii Gagliano Fecit in Napoli Anno 1732 is estimated at £80,000-£120,000. It is sold with the certificate of Emil Herrmann, Berlin, dated 12th September 1935. The sale also includes two fine examples of 18th century Venetian violin making. Venice was at that time the second most important violin making town in Italy, after Cremona. Indeed, in 1717, Pietro Guarneri, the youngest of the Guarneri dynasty of violin makers, left Cremona and moved to Venice, a bustling musical and artistic town, where making a living as a violin maker was no doubt easier than in Cremona, where the Stradivari workshop was dominant. The three most important makers in Venice between 1720 and 1750 were Pietro Guarneri, Carlo Tononi and Santo Serafin. Both are renowned for the accuracy of their workmanship and the beauty of the wood they used. An example by Santo Serafin (b Udine, 1699; d Venice 1776), dating from 1743, carries an estimate of £200,000-£300,000. It is labelled Sanctus Seraphin Utinensis, fecit Venetijs Ann. 1743 and bearing the maker’s brand Santo Serafin on the bottom rib by the end pin. A violin by Carlo Tononi (b Bologna, 1675; d Venice, 1730) is expected to fetch £150,000- £200,000. Branded Carlo Tononi on the back below the button, it is sold with the certificate of J. & A. Beare, London, dated 12th January 2011. *Luthiers Sans Frontières recognises the important role of music and practical skills in fostering social development and improving the life chances of young people, especially in countries where there is political or economic difficulty. Since 2008, LSF UK has undertaken six missions in Haiti, Ecuador, Afghanistan and Uganda. LSF UK operates on a totally voluntary basis and is financed through fundraising and donations.